At Lynnfield High school, half of the students are using Acer Chromebooks and next year, the entire school will have chromebooks. In anticipation of a 100% chromebook building, we reviewed a very useful new extension and then we were fortunate to actually sit down with memebrs of the company. 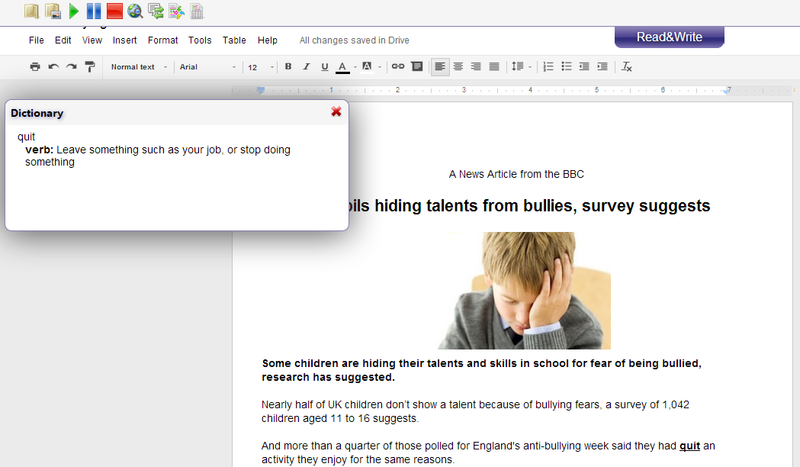 Read & Write for Google is a Chrome extension that provides comprehensive reading and writing supports for Google Docs and the Web as well as PDFs, ePubs, and KES files stored in Google Drive. The prediction feature for Read & Write for Google works in a helpful and efficient way. In order to use it one would turn on prediction by clicking on the first button in the drop down menu then begin to type. As one types a list of possible words will appear below the line being edited. Prediction is geared towards those who may need help when typing, whether for spelling or other reasons. It is fairly easy to begin, and offers words based on their part of speech. Prediction can offer anywhere from three to ten suggestions. The dictionary is a very basic feature. Simply click on the picture of the book in the drop down menu then on the word, and the dictionary will pull up multiple definitions in various parts of speech. Often, the word will also be used in a sentence to further exemplify it’s meaning. The picture dictionary is another good feature of Read & Write. To do this click the image symbol in the drop down menu then the word, and a cartoon illustration will appear. This can be very helpful for students with learning disabilities or who have a hard time with vocabulary. The picture dictionary is limited, and various words can have the same image. Though it is helpful, googling the image may be easier and possibly more helpful. The Audio feature is very helpful. It allows students to hear their writing out loud. hearing ones writing can help make editing easier. This can also be helpful when studying or completing a reading assignment for any class. The play, pause and stop button are each used for this feature. Audio is read by highlighting the dialogue with the cursor and pressing play. By accessing the settings in the gear icon on the toolbar, the voice and speed of speech can be altered. 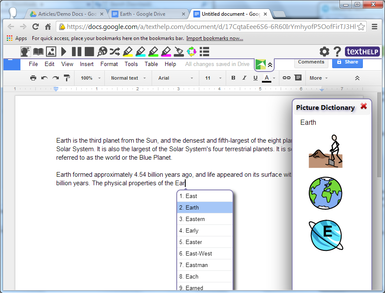 Fact Finder works by highlighting the word with the cursor and clicking Fact Finder, the image of the earth and a magnifying glass, in the drop down menu. The option will open a new tab with a Google search for the term. This allows a quick way to research using the extension. Speech input is a very beneficial feature. 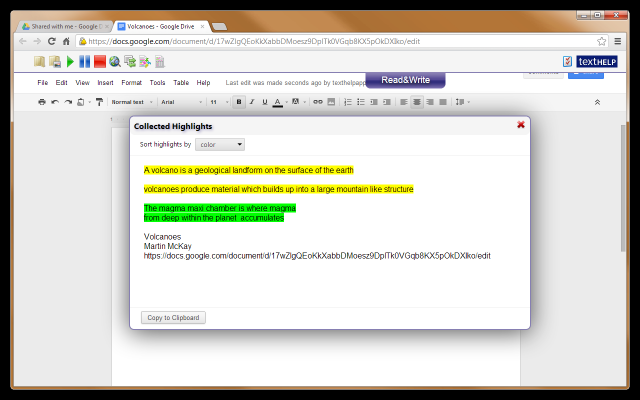 It allows a student to speak while it types what is being said. There is usually no problem with homophones as the extension notes which part of speech should be used in the context of one’s writing. When paired with the option to listen to audio, it is extremely beneficial, especially when working in other languages. There are also vocal shortcuts, such as period and comma. However, there is no way to vocally adjust the font, spacing or margins. Translator works by tapping the word and pressing the arrows on the toolbar. By accessing the settings through the gear icon, translator can work in both french or spanish. The feature also provides the part of speech of the word. This is extremely helpful when working on any assignments in French or Spanish, however, no other languages are offered. The highlighters simply highlight the selected text on the page. The broom clears all the highlights on the page. The four arrows in a circle collect the highlights and create a new document in one’s drive. This new document organizes the highlights by color. By hitting the vocabulary button, a new document is made. The highlighted word appears in one column, followed by the meaning, an image from the picture dictionary, and an empty column for notes. The words are organized by appearance in the text, not alphabetically. One feature that sets Read & Write for Google apart from many other annotation extensions is its ability to be used on a webpage. By clicking the puzzle icon in the search bar on websites such as Wikipedia, another icon will appear. The icon shows on the top center of the screen.This feature appears as four lines and an arrow. By clicking this, a new tab appears with the information from the last. All of the previous features are consistent through this branch of the extension. One additional characteristic is the option to simplify the page. By clicking the addition or subtraction sign, the viewer can choose how much of the original article they see. In conclusion, Read & Write for Google has many features which can be very helpful to a student at lynnfield high school. It can be applied to many subjects such as English, History, Foreign Language, and Science. It can be used to improve the quality ones writing and to assist in the editing process as well as the writing process. Its features provide valuable learning tools for the average student. The extension is available for free on the Chrome Web Store. The extension works the best on chromebooks but can also be used on a laptop or desktop computer. An amazing opportunity arose for the Help Desk Students. Mrs. Judkin’s presented the the opportunity to meet with two members of the Read & Write for Google company. Armed with our knowledge of the product and all the ideas that came with it, we were able to have a meeting. We were given the ability to make suggestions and give feedback regarding the extensions. The company representatives were very receptive to our suggestions. While it was interesting to use the extension, it was far more interesting to interact with people who work with it everyday. This allowed for both parties to leave the meeting with a different view of an extension we had been so diligently working with. They were able to provide tips for working with the product as well as offer great ideas on how to apply it in other uses. The meeting was highly beneficial and the Student Help Desk is very thankful to be given the ability to talk to the company representatives. Excellent suggestion for an extension! Thank you!